After opposing Grover Cleveland for years and supporting Senator David B. Hill of New York for the 1892 Democratic presidential nomination, New York Sun owner and editor Charles Dana endorsed Cleveland after the Democratic National Convention in late June. Here, in a scene loosely based on the biblical story, Dana is depicted as a Democratic Jonah entering the belly of the Cleveland whale. 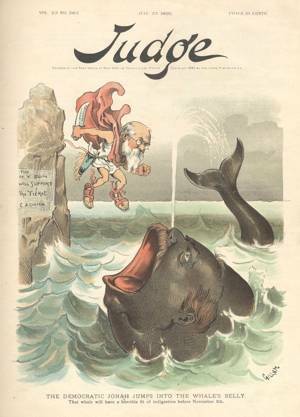 Likely trouble ahead for the new Dana-Cleveland relationship is conveyed by the choppy waves, the dark tone and gaping maw of the Cleveland whale, the high cliff from which Dana jumps, and the large knife the editor grips.